It’s fair to say that pallets move the world. They are an essential part of the modern supply chain. We use pallets for storage and transportation. Plastic pallets can double as product displays in the stores. Typically, pallets are made of wood or plastic, with the large majority still made of wood. Both materials have advantages and disadvantages. This infographic will help you to understand the differences and make an informed decision when purchasing pallets for your business. Plastic Pallets are typically used in transporting fresh and frozen foods and pharmaceutical or other products with strict hygienic requirements. Plastic pallets aren’t porous and are easy to clean, wash or sterilize. Plastic pallets are about 3 times more expensive than wooden ones. They are lighter, but their sleek surface also makes them slippery and less stable for stacking. They are not suited for loads heavier than 1,500 Lbs. If you ship products overseas or outbound with no way to return and reuse them, pricey plastic pallets would unlikely be an economical business choice for you. It may change if you ship via air freight, or because of your hygiene requirements, or if you are shipping to countries that regulate and prohibit the import of wood pallets. While plastic pallets are often promoted as eco-friendly, they can’t be easily repaired. They must be melted down to be recycled. However, they have a significantly longer lifespan than wood. The main benefit of plastic pallets is that they can be reused for a long time without breakage. They are perfect for storage and reuse in warehouses. They are sleek, light and splinter-free, friendly for manual handling. The durability of plastic pallets makes them ideal for use on pallet wrapping machines. Wood Pallets are about 3 times less expensive than plastic pallets and at least 10 times more widely used. They hold more weight than plastic, can be used for weight between 1,500 and 3,000 pounds, easily repaired and reused. They are however not ideal for fragile items. Fasteners used in wood pallets can damage the goods. They pose a puncture hazard. Imagine the punctured can of paint, for example, that would cause not just damage, but a clean-up and delayed arrival. Wood pallets do not have the same fire safety rating as plastic. 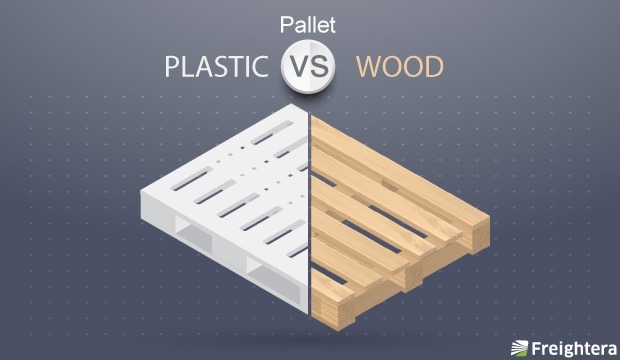 Plastic pallets burn at a much higher temperature than wood, so manufacturers are advised to check the building fire codes when deciding what pallets to purchase. In summary, there are advantages and disadvantages to using both wood and plastic pallets. Your choice depends on a combination of factors like your product and industry, applicable standards and regulations, budget and long-term economics.